The best homemade Gluten-Free Red Velvet Brownies. Thick, chocolatey and chewy! With a dairy-free option. Chocolate and Valentine’s Day go hand and hand. One of my favorite flavors of baking chocolate treats is red velvet. There is something just so decent about red velvet. 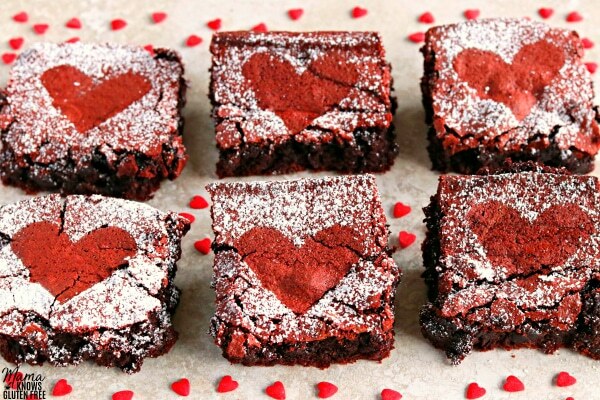 These gluten-free red velvet brownies are so easy to make. It’s really just a fancier version of my Gluten-Free Brownies. Spray the 8×8 square baking pan with gluten-free non-stick cooking spray or line the baking pan with parchment paper and coat the bottom and sides with gluten-free nonstick cooking spray or butter. In a medium-sized bowl combine gluten-free flour, xanthan gum (leave out if your flour already has it), cocoa powder, baking soda, and salt and whisk together. Add the tablespoon of the gluten-free red food coloring and mixed until fully combined. Pour the brownie batter into the greased 8×8 sized baking pan. Allow the brownies to completely cool before cutting them. Enjoy! 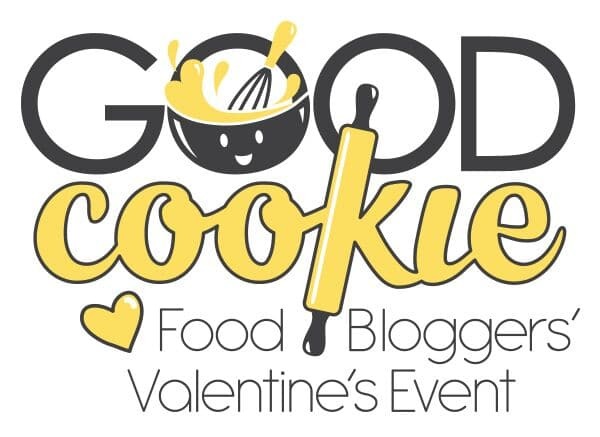 This is the third year for the Valentine’s Day event for Cookies for Kid’s Cancer! 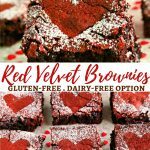 I have teamed up with a group of my food blogger friends to share Valentine’s Day inspired recipes to help raise funds for pediatric cancer. We want to make a difference in the fight against pediatric cancer! 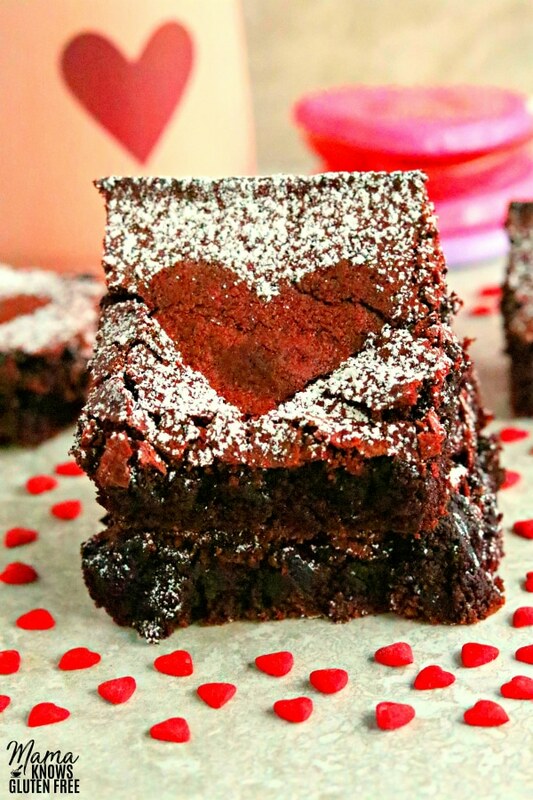 One of my love languages is baking, so I was really blessed that I could help raise awareness of pediatric cancer and help raise funds for Cookies for Kids’ Cancer by sharing a Valentine’s Day recipe with you. My heart is my children, and I could not think of a more worthy cause to help support than pediatric cancer treatment research and awareness. Our goal is to raise at least $3000. Because these three companies: Dixie Crystals, Mediavine, and OXO have each pledged to match our donations raised through this campaign up to $3000!!! 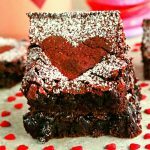 More Gluten-Free Desserts Perfect For Valentines Day! 3/4 cup all-purpose gluten-free flour I like Pillsbury gluten-free. Not all gluten-free flours are created equal. You may experience different baking results depending on the gluten-free flour blend you choose. Add the tablespoon of the red food coloring and mixed until fully combined. Pour the brownie batter into the greased 8x8 sized baking pan. Allow the brownies completely cool before cutting them. Enjoy! For the dairy-free option I used Smart Balance butter. 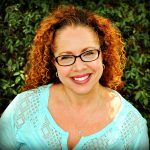 You are so welcome Julie! It was a real blessing for me to participate again this year. Thank you so much for organizing such an important event!